The back of the store is full of boxes, maybe around 100 of them. There are more coming. We think Carolyn might be buried in the back of this stack. We're looking for her. 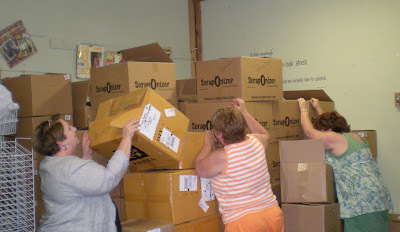 At least we will find her on Tuesday when we load the truck for the Great American Scrapbook Convention in Arlington. Come see us there! We'll be in the crop room on Wednesdy & in booths 317 & 319 Thursday, Friday and Saturday. See you then! CAR-O-LYN! Are you back there??? Here is another sample that will posted in the booth next week at the Great American Scrapbook Convention in Arlington, TX. This was so easy, and I was able to complete in one evening (in between interuptions from Matt and his friends, they had to make flags out of something other than paper). The main reason for this sample was to showcase the Maya Roads ribbon. Just about everything is Maya Roads: ribbon, flowers, chipboard letters. The rest is from my stash! And the hangar is from Crafty Secrets. 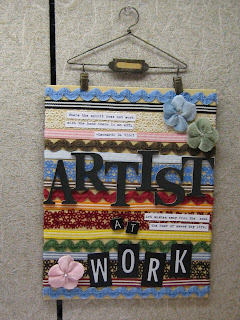 I scraplifted this idea from Keisha Campbell's blog, check it out here http://abiteast.typepad.com/. I also used a flat canvas board and really, really liked the end design. I will be making more, no doubt about it. Get inspired, and you never know what you might come up with. This one will hang in my studio forever....I mean who wouldn't be inspired by all that COLOR! I am framing this for a gal I work with. She had this precious baby girl 6 weeks ago and is now back at work. I can't wait to give it to her tomorrow. Everything is from the Basic Grey Sugared line. Just added some Stickles and it was done. Complete doesn't HAVE to be fancy. Sometimes just plain and simple can make a layout perfect. I am calling this one done. Happy Memorial Day! I thought I would share a LO that I did the other day. This is a LO of my two great uncles home on leave from WWII. I had uncles in every branch of the service. During WWII, two were killed and two were injured. So on days like today, it is nice to remember those who came before. I used Jenni Bowlin and Simply Luxe papers. Luxe alphas and the doodle roller. Glitz Icing. I had the most awesome and productive weekend. I had the fantastic opportunity to spend a free day at The Stolen Moments Inn with several of my good friends and my mom scrapping and creating. Thank you Susie for such an awesome weekend. the four pictures. So I made it into a pull out and a flip boook. The big star pulls out to show another picture. I don't know why I don't have a picture of it. I also see that I need to cover the back of the star. I used Jenni Bowlin Paper and Simply Luxe. The stars are Jenni Bowlin and the treble cliff is Maya Road. I always feel recharged and ready to create even more! We are off to the wilderness to spend Memorial weekend with friends, I have my lounge chair, a good book and lots of junk food. The girls at the store have kicked me out and said I cannot call unless its an emergency. HOPE EVERYONE HAS A GREAT WEEKEND, and YES the shop is open Monday, I just will not be there! I have spent the last 2 days enjoying the wonder of a computer that was just not feeling too well. The worst part - it wouldn't let me access certain sites that I love - LIKE BLOGGER! . So now I have restored my computer to its original state, installed (hopefully) all of the software that I use and tweaked and poked and adjusted until I think I have nursed it back to health. Last night it was 3 am. when I finally gave up. Tonight I will be thrilled to be in bed by 1am. And tonight I feel like I actually accomplished something. But before I head off to bed, I had to share this project with you. This is a 24 x 36 canvas that I did for a lady at my office. She wanted me to come up with a large piece of art highlighting her son and his family. So here it is. I was inspired by the 6x6 canvas art that each member of the design team created. So find some inspiration like I did and branch out. Enjoy! PS: pop over to my blog if you have a moment. I posted a digital layout that I recently completed. I am just learning digital and I THINK I love it. It's so hard to believe Denton has grown up, I miss those blonde curls, his favorite yellow duck he teethed with and all the things I had to help him with because he wasn't big enough to do them himself. But I am so proud of the little guy he is becoming, and what a great job he did today when he had to do his little part in the graduation. And a big "THANK YOU" to his awesome teacher Ms. LaGrone! We prayed for God to send Denton a teacher that would be perfect for him, and our prayers were answered and what a wonderful year we had getting to know her. This sign actually made me cry, it seems far away but not really.........so enjoy each minute of your childs life, they go by so fast! Don't you just love new gadgets! My class with Ten Second Studio was awesome. My mother and I totally had a fantastic time. The gals were so wonderful that when mom and I had to leave for our family reunion, we were able to take what we had learned and finish our projects at home that night. I took Sherri's challenge and used my handwriting to create a border around the plaque. Working with metal is out of my comfort zone. As I was working, I kept griping about all the individual letters. I was really hard on myself and didn't like the way it was looking. But....when I put it all together, added my cherry bling, my flower and my border and sanded a little, I really liked the way it looked. I think it will look great in my new scrapbook room. Downtown Waxahachie started the weekend off with a live band playing outside the courthouse and a carnival for the kids, this was to kick off the celebration of the Mini Grand Prix that races around the downtown square every year. As usual I always forget about all the events and plan a big event at the store. This weekend we had Cheryl Darrow and Tracy Pounds from Ten Seconds Studio come teach two awesome classes. 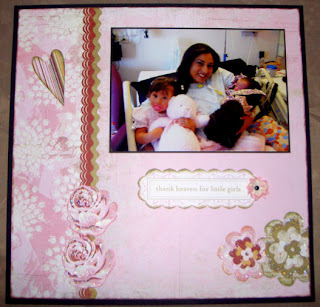 Here's a picture of the sheer book Tracy created just for the Crafty Scrapper customers. We had so many customers come from all over the meteroplex, some even drove all the way from Austin to take these classes. The reviews from the customers were that this was one of the best classes they have taken and a wonderful day spent at the store. Thank you Cheryl and Tracy for bringing two great classes to the store........we love your product, your creations, and especially your personalities! With 3 scrapbook retreats going on, all the events at the square, classes back to back and people shopping at the store for the first time........it was a crazy fun filled weekend. Hope you enjoyed your weekend! I have been looking at this little Maya Road album and thinking it looked like the shape of a shell. It is actually a large flower with the center the large circle and the small portion the petals, but it kept catching my eye as a shell. So I finally gave in and made it into a little album with a shell on the cover. I used miscellaneous ribbons & fibers and a little K&Co charm as well to try to give it a beach feel. The word 'life' is a rub on. I love this poem/prose piece and thought it fit the shell theme, then printed out a few pictures of my brother's family at the beach. The colors of them and the sillhouette picture were great. I used pearl mixative from Ranger over the real shell to make it shiny. The small shell is actually an embelishment from K&Co, as is the one inside the book. I used the mixative on those as well as chalk inks to adjust the color and sheen. Although I am like most of us and don't like to see my own handwriting & think that it always looks better typed or printed-I did write in the book. I am trying to push myself on this and just have to do it and move on. Its my writing, not artistic, but mine. The papers are K & Co as well. I also used scalloped sheers and travel chipboard key ring pieces from Maya Road for decorating the pages as well as a few embelishments from the paper line and a few ribbon/fibers. A few ribbons and stamping and I decided it was done. Overall, I'd say I was pleased with the results although parts of it 'annoy' me, I think it turned out ok. I leave you three challenges from this experience: 1) try something you have been wanting to for a while &/or 2) make something into something it was not intended to be &/or 3) use your own handwriting on pages even if you don't like the looks of it. I love elements! I love just looking through the racks and looking at all that shiny bling. Buttons, stickers, flowers, chipboard....you name it, I want it. But...when I get home, instead of using it all up, I stare at it in cute little containers. Well no more of that. I am making my elements work for me. No more using one element here or there. That makes the layout look flimsy. Make a powerful statelment by grouping your elements together in clusters. 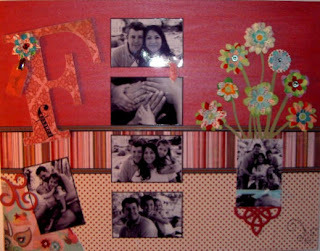 In this LO I used Zach's Life paper and elements from Little Yellow Bicycle. (This is a must have for your big boys.) I grouped journaling strips on the right side of the paper. Then, on the bottom left hand corner, I used the sticker buttons and stickers as well as a Maya Roads swirl. I used a pop dot, or sometimes two to create some added depth and dimension. I took a pictures so you could see how I did it. I think the LO works. I don't think it would have looked nearly as cute with only one or two elements. Besides....those elements would still be stuck to the contact page. So...be bold....be daring...use those elements. Make them work for you. They are decoration for your page not your scrapbooking nook. This is a great Melissa Frances Book that I made into a family favorite recipe book. I used a variety of papers--all in black and white, which I think is fun. I used a lot of the Crafty Secrets pages from their new books and the tomatoes are Martha Stewart's little fabric ones. I thought the red accents were fun. I used Maya Road letters for the front--chalked with red & covered with mod podge. I picked a lot of ribbons to tie onto the top--I love tying ribbons onto things. Sometimes it is my favorite part of a project. Be sure to take a look at the book next time you are at the store! I like to challenge myself every once in a while and Sunday night I decided I needed to do this project with only TWO pieces of 12x12 paper. I allowed myself a sheet of black paper too for some matting - but that was it. The secret to my success was double sided paper and scotch tape. I love slicing up sheets of paper and taping them back together, instead of layering them. The design seems cleaner and the paper stretches further. The paper I used was from the Cogsmo collection of Cosmo Cricket. Lately I am just in mad, passionate love with CC. 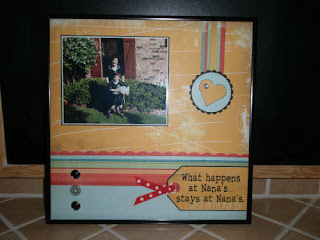 I recently completed a project for a gal at work using the Dutch Girl collection. I think that is when my love affair begain with Cosmo Cricket. Anyway, back to my challenge. I truly had 2 little 5x2 and 3x4 bits of paper left when I completed this. So my challenge was a success. What can you do with two sheets of paper? 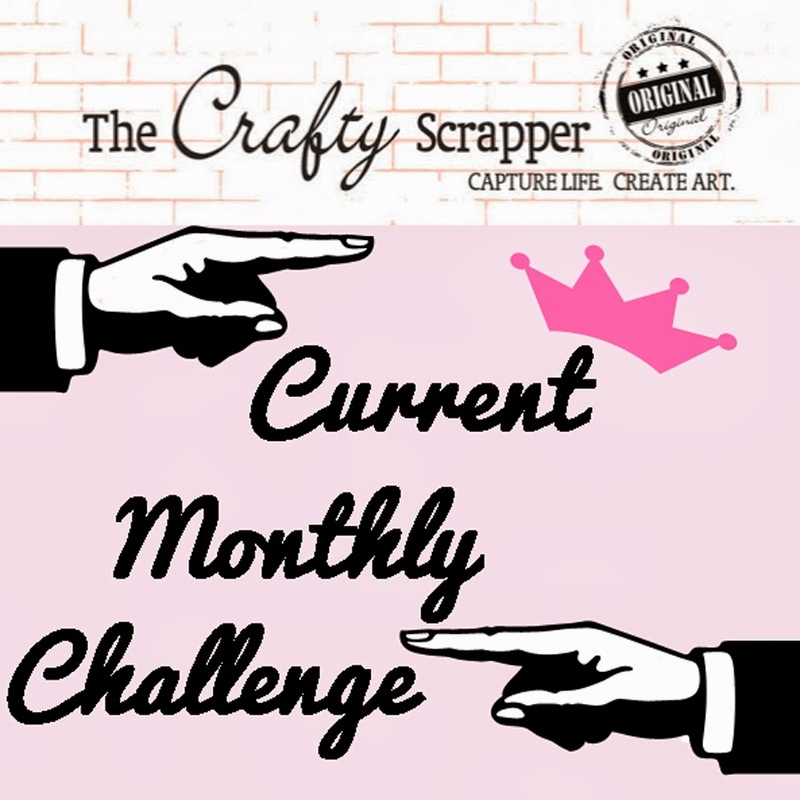 We would love to see it at the Crafty Scrapper next time you come by. When we were in California at CHA Ranger had a display of 8x8 canvas that several designers had created. It was fun to guess which canvas belonged to which designer. So I thought it would be fun to have the design team here do the challenge, little did I know I needed to do one too...but I am always up for a challenge. I used some fun technique's on this one. I first stamped the canvas with one of Tim Holtz new stamps, stamped the edge with a script stamp, then placed a Heidi Swapp mask on to spell family. DO NOT use heat gun, I melted the mask and should have know better, put I was being to impatient, LOL! Then I painted sunflower paint and crackle vintage photo crackle paint covering up the background stamp. The picture was printed on fabric and curled up. The flowers are made with metal, I used 2 molds and then cut them in the diecut machine, inked and curled them. You can see that background stamp in the middle of the flower. The little family saying on the right, was typed on Joanna's new German typewriter...yes I am now in search of one and have bought one of her extra typewriters for the shop. This was fun to do, I just went at it and tried everything I have been wanting to try! More winners! Aren't you gals lucky for hangin' with TCS for NSB weekend!!!! Heidi here, I am highjacking Carolyn's blog to update everyone on the shenanigan's we have been up to. Joanna has found a vintage smock at one of the antique stores on the square. We have been gigling quite a bit because with her shorts and the smock on, you can not see her shorts!!!! Between that and her banging away on her new vintage typewriter, she looks like Polyanna! Megan from 10 second studio has been teaching us new uses for Glimmer Mist (hairspray!) 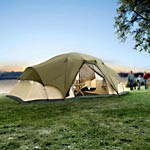 And there is so much new product in the store and so many people it is great. Not to be forgotten Sherri's new pedicure!! Oh, and there are people scrapbooking. See more pictures on the design team blog here.